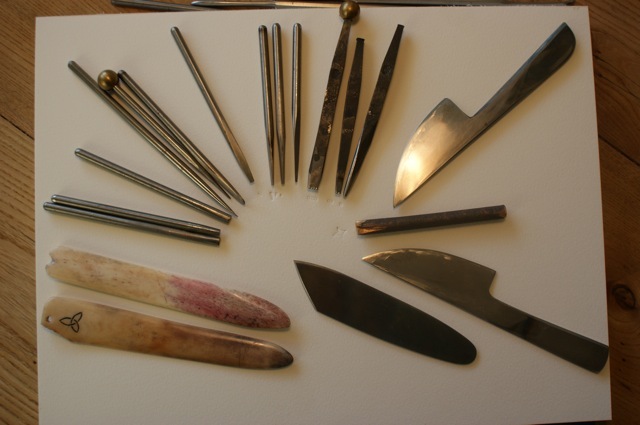 I had to cancel this years knife maker show in Solingen because of warnings of a flare up of my old tendonitis. All went well, but work was slow for a while. Now as summer starts to show promise of the coming autumn, I have finally put the last touches to a sword that was intended for the Solingen show. 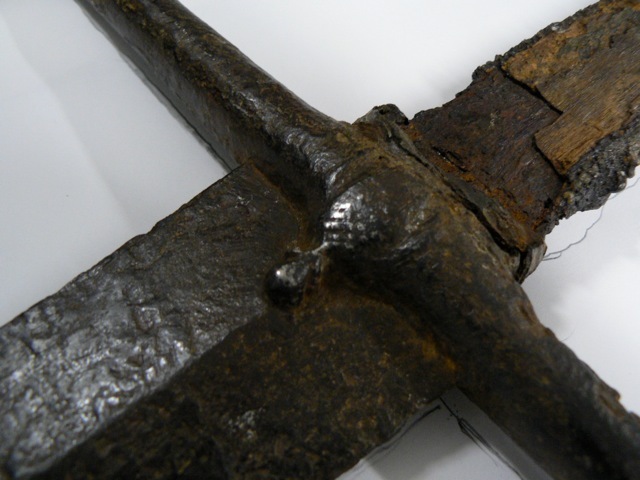 It is a long sword of a style belonging to the mid 15th C. A few swords of the Castillion group has been primary inspiration and source of information, but other swords have also supplied both data and inspiration. The guard is directly influenced by a two hander from the Castilion group that I got to document at the Royal Armouries a few years back. The grip with its spirally bound cord under the embossed leather is taken from a German long sword kept in the Army museum in Paris. Overall shape and proportions are influenced by those medium sized long swords of the Castillion group. It is of type XVIIIb and has a powerful and responsive feel to it. I wanted to make a sword that was not light, but rather compact and rather hefty. 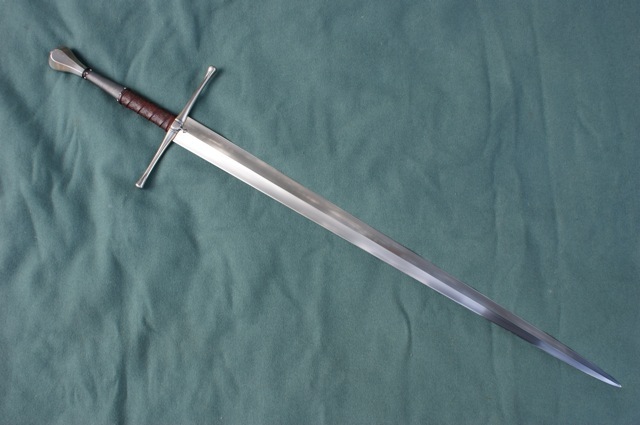 Its dynamic balance is strongly influenced by the sword of Svante Nilsson. In the hand the sword feels much lighter than its 1.96 kilos: on horseback you could use it single handed for powerful deliberate strokes, but it will invite two handed use when fighting on foot. The blade is 88.5 cm long. At the base it is 5.2 cm wide and 1 cm thick. Shaping of the edge and hollow ground section is influenced greatly by the sword of Svante Nilsson Sture, only made a few cm longer and a bit more pointy. Forward pivot point is right at the point, giving good control and precision for thrusts as you move from guard to guard. Point of balance is 7 cm in front of the guard. In fact, the original idea behind this sword was to make a weapon with similar size and balance as the sword of Svante Nilsson. Even if this sword looks very different they share quite a bit of the same character. The grip is made of calf and goat leather (goat leather is used for the part under the wire wrap). The grip cord is fully cord wrapped and the forward part is given a spiral winding of cord to create a riser. The spiral cord is inspired by suriving swords and depictions on effigies. The narrow part of the grip is bound by fine twisted iron wire and secured by domed tacks. 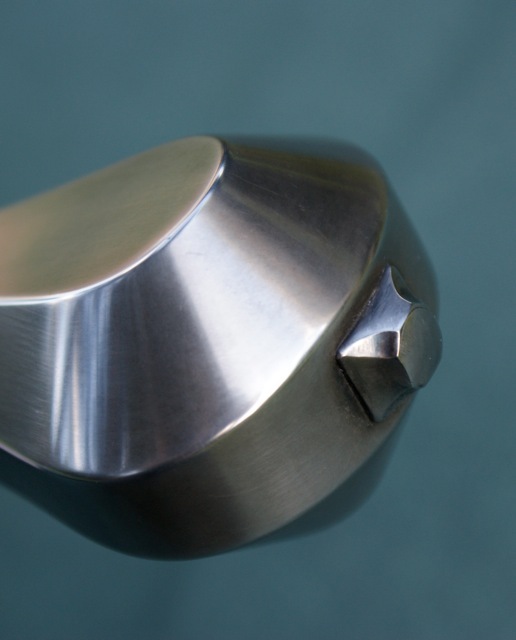 The wire provides good purchase and will also strengthen the narrow part of the grip. Below are some snap shots showing full length and some details. I hope it can go as an answer here. As far as I see, it's somehow similar to Alexandria and Principe Albion projects, isn't it? Short(ish) XVIII blade with quite long handle? Thank you for showing this wonderful piece of art. 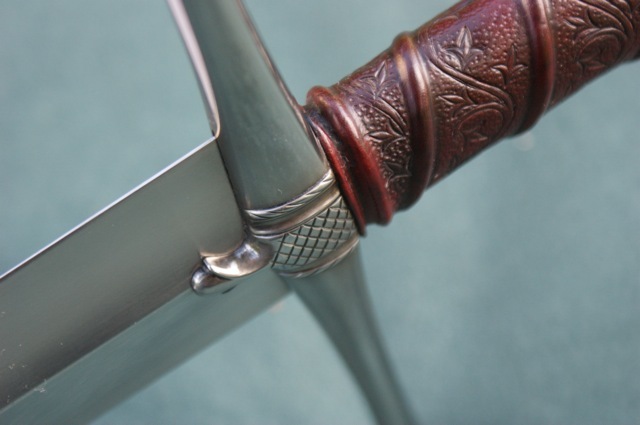 Bartek (Edit: and Markus), The pommel is of the same type as the "Principe" will have (with some minor variations). You could possible say that the swords are of some basic similar type, although the very wide XVIIIc is dramatically different in looks. As to proportion blade/hilt, this XVIIIa is perhaps closer to the "Alexandria". Being a craftsman supporting myself on my trade these numbers represent large sums, but in hourly pay it does not represent a high salary. Living in Sweden much is eaten away by taxes and VAT within the euro area. Goodness Peter, I absolutely love your work. Every aspect is truly inspiring & desirable. Of course, I love the leatherwork you did. Wow!!! The attention to detail is just mind boggling. Gosh, that's something. . . else. . . . whoa. . . . This sword is stunningly beautiful. The finish looks perfect. Congratulations on a beautiful piece! Pufffff! That is the most beautiful grip I have ever seen. And the rest of the sword is just amazing. Nice work and thanks for sharing. I just love the handle work. The hilt detail is great too but the handle is fantastic. Peter, that truly is a masterpiece. In fact I honestly felt my jaw drop a little when I scrolled down to the pics ; absolutely beautiful sword. Its always a joy and a pleasure to see your work. I love the leather work on the grip its exquisite, lovely deep, rich colour and finish. How did you execute the tooling? Was it done before you applied the leather to the core or after? That is gorgeous. I especially like the grip detailing. 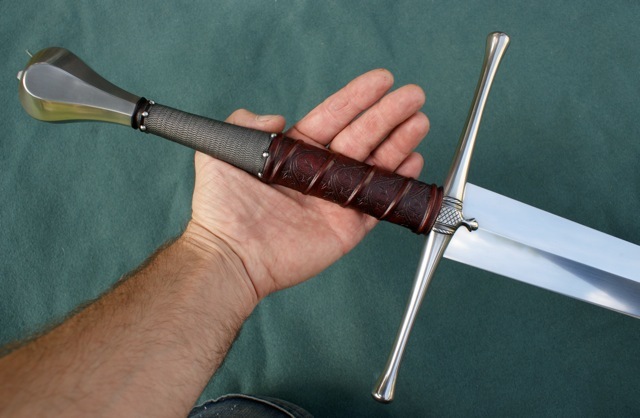 I have been contemplating giving a go at such a grip since I saw that sword in the musee de l'armee in Paris. Your leatherwork is gorgeous, to say the least! Wow is all I can say. That is a very beautiful sword. Thank you your words are much appreciated. On leatherwork: it is the same basic construction I normally do: wood core, with under wrap and raisers of cord. Leather put on thoroughly soaked while still damp and set with hide glue. The pattern is done last before the leather dries. It is a combination of incising, pressing and embossing. 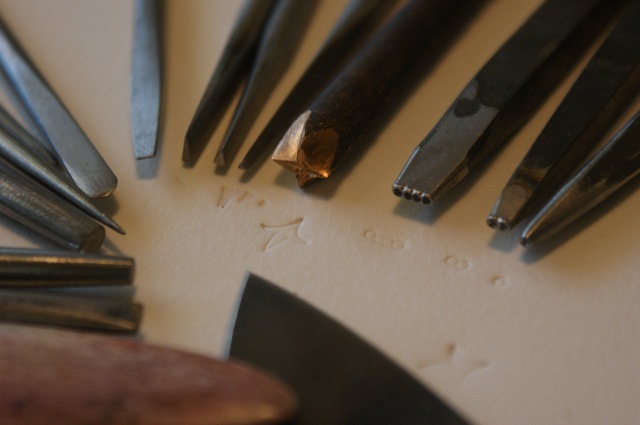 For the leaves I use a stamp that´s carved in the end of a bronze rod. 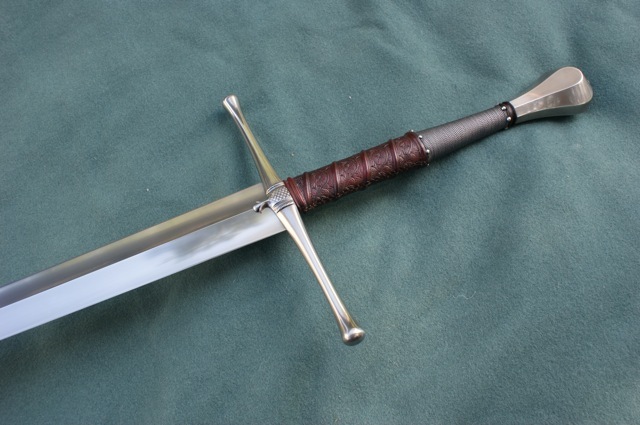 That is a great and beautiful sword, but then, one can say that about all of Peter's swords. The old phrase, "fit for a king", definitely applies here. 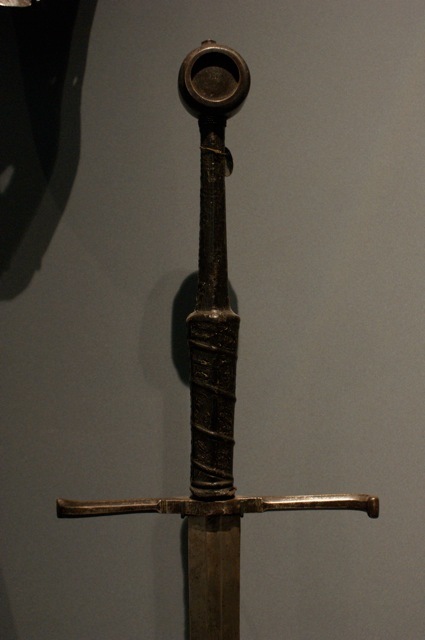 I love all those Castillion/Dordogne swords. I wish there were more re-creations of members of that group.